We love Little Hedgehog, he really should be hibernating at Christmas but he wakes up because he is so cold. When he receives a present from Father Christmas, the present doesn’t get used in quite the way it should be! The Story: Little Hedgehog is too cold to sleep. Suddenly a present from Father Christmas falls out of the sky, it’s a hat which doesn’t fit Little Hedgehog. Little Hedgehog braves the snow to give the hat to Rabbit then gets lost on his way home. Rabbit gives the hat to Badger who gives it to Fox. When Fox finds Little Hedgehog frozen in the snow he carries him inside the hat to Rabbit’s house. Little Hedgehog is warm and cosy and falls into a deep winter sleep. 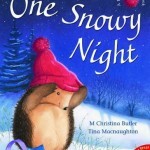 One Snowy Night is a feelgood, festive story about friendship and giving. When Little Hedgehog realises that his hat doesn’t fit he decides to give it to his friend Rabbit. As the hat is passed on to the other animals it gets stretched until it reaches its final recipient. Fox isn’t very grateful when he receives the present which provokes a gentle reminder from Badger about being nice to each other. Little Hedgehog eventually makes use of the present, it just works better as a sleeping bag than a hat! Little Hedgehog is a loveable character and we particularly empathise with his confusion when he tries to find his way back home in the snow. His pleasure at giving to Rabbit conflicts with the knowledge that he shouldn’t have gone out in a very foreign looking, snowy environment. The final scene with Badger, Fox and Rabbit watching him sleeping is lovely and portrays the caring nature of the woodland animals’ friendship. Tina Macnaughton’s cold, snowy scenes contrast beautifully with the warmth and cosiness of Badger and Rabbit’s houses and the pages switch between cold and warm pictures. The gentle text is easy to read but although it mentions Father Christmas, he’s not shown in the pictures. 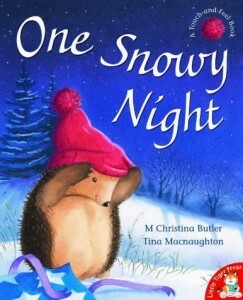 One Snowy Night is a lovely Christmas bedtime story.